Aldi is a German-based discount supermarket chain and one of the largest retail chains worldwide. The chain is split into two separate groups; Aldi Nord (North) and Aldi Süd (South), which operate independently from one another in specific regions of Germany and in separate international markets. Aldi’s German operations consist of Aldi Nord’s 35 individual regional companies with around 2,500 stores in Northern and Eastern Germany, and Aldi Süd’s 31 regional companies with 1,600 stores in Western and Southern Germany. Internationally, the Aldi group operates around 8,078 individual stores. Aldi Nord operates in Denmark, France, Belgium, the Netherlands, Luxembourg, Spain, Portugal, and Poland, while Aldi Süd is responsible for markets in Ireland, the UK, Hungary, Greece, Switzerland, Austria and Slovenia, the United States and Australia . Aldi’s roots trace back to 1913, when the mother of Karl and Theo Albrecht opened a small store in Schonnebeck, a suburb of Essen, Germany . The brothers took over their mother’s business at the end of World War II and soon opened another retail outlet in the area. By 1950, the Albrecht brothers operated 13 stores in the Ruhr valley. The Aldi brand name was introduced by the brothers in 1962; two years after the pair divided the company following a dispute over the sale of cigarettes. Both groups have been financially and legally separate since 1966, but describe their relationship as a “friendly relation”. Aldi expanded internationally in the 1970s and 1980s, with new outlets opening across Europe on a frequent basis, especially after German reunification. The brothers retired as CEOs in 1993 and gave most of their wealth to foundations and charities. However, they still remain Germany ‘s richest men, earning an estimated 1.5 billion Euros per year from their supermarket business. Aldi opened its first UK store in 1990. It has since grown rapidly and now operates some 300-plus stores across Britain . Aldi stores primarily sell food and drink, but also stock a selection of health and beauty products, sanitary items, baby products and other inexpensive household items. All stores stock an extensive range of fresh fruit and vegetables, frozen foods, fresh meats, fish, desserts, baked goods and alcohol (mostly wines), and also include a cheese emporium. UK stores also feature bargain-priced, gourmet foods imported from Germany . Many of Aldi’s products are own-brand labelled, with the number of non-Aldi brands being very limited – usually just two different brands for each type of product. This system allows Aldi stores to be smaller than general supermarkets which cover the same range of products but with more variety. Aldi also offers customers weekly special offers. The company’s Sunday and Thursday ‘Special Buy’ deals offer a range of products at bargain prices, from electronics and car accessories to clothes and household/garden appliances. ‘Specials Buys’ are only available in limited quantities and for a limited period (one week). Aldi is able to offer deeply discounted prices on around 1,300 popular food items (a typical grocery store has 30,000) due to its various cost-cutting strategies. These include buying cheap land on the outskirts of towns and cities, building cheap warehouses, employing few staff, keeping store furnishings to a bare minimum and carrying mostly private-label items, which are displayed on pallets rather than shelves. Aldi also charges its customers for carrier bags. 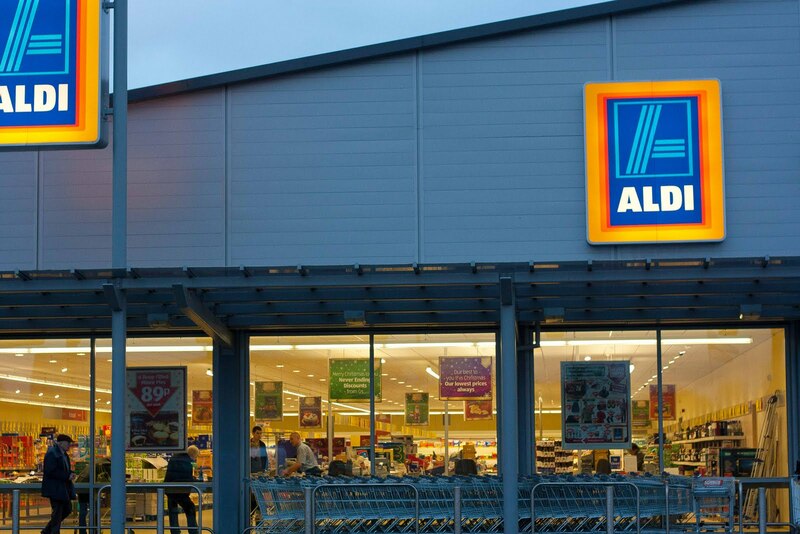 In the UK, Aldi remains a small player with a grocery market share of around 3%. But analysts expect this figure to steadily increase in 2009 as more consumers seek cheaper prices amid the economic downturn. Alditravel.co.uk is the retailer’s own UK travel website, offering a range of exclusive value holiday deals to popular European destinations. The site – launched in January 2009 – offers customers 6 holiday deals every two weeks, including family holidays, city breaks and beach holidays. All holidays are ABTA-protected and include Supplier Failure Cover within the price. Aldi Travel is already the second biggest travel operator in Austria and also a successful venture in Switzerland and Germany . Aldi’s Photo Service allows customers to order print products by sending digital originals over the Internet or on a data storage medium. Products include calendars, photo books, canvases, posters and greeting cards.